The release of Suicide Squad is leading up to be one of the biggest home media dates of the year, scheduled for disc release on Tuesday, December 13th along with an Extended Cut of the film. Warner Bros. Home Video is packaging several standard combo editions, as well as partnering with retailers on more exclusive releases. 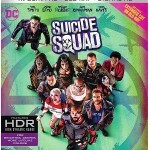 On Blu-ray, Suicide Squad will be available in a 2-disc Blu-ray edition with DVD ($24.99), 2-disc Blu-ray 3D edition with Blu-ray ($29.99), and 4k Ultra HD Blu-ray edition with Blu-ray ($29.99). All Blu-ray combos also include a Digital HD copy redeemable for a limited time through UltraViolet partners. The Blu-ray Discs are formatted in 1080p at 2.4:1 widescreen aspect ratio, while the 4k edition improves video resolution to 2160p with High Dynamic Range color (for TVs that support HDR only). All of the Blu-ray editions also feature English audio in Dolby Atmos and Descriptive Audio 5.1. 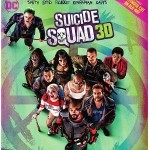 Special features on the Blu-ray editions include several featurettes such as “Armed to The Teeth,” “Joker & Harley: ‘It’ Couple of The Underworld,” and “The Squad Declassified,” as well as a gag reel. The extras are not available in 3D. And, the Blu-ray releases will include both the theatrical and new extended cut of the film. Warner Bros. is also releasing a DVD edition of Suicide Squad ($17.99) that includes some, if not all of the extras with the Blu-ray editions.